When I think of back to school and all of the running around, late nights, car pooling and daily errands, it makes me overwhelmed on some days to also think about making a meal with lots of steps, instructions and prep work. Sometimes I need an easy meal. A meal that taste good. I also love to have left overs. 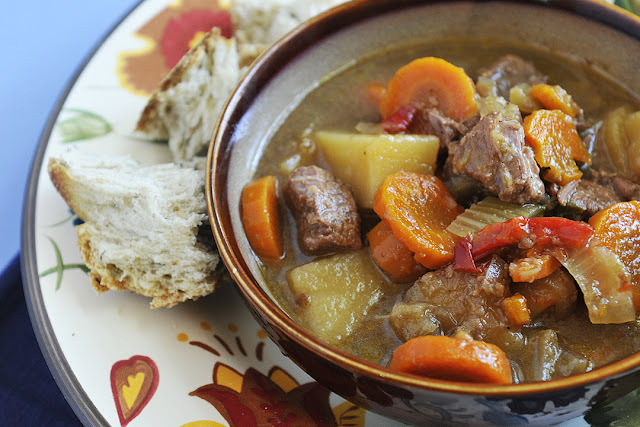 This stew recipe is perfect for all of those desires. The thing I like about making a stew, are that the combinations are endless. For us, it is based on what we have in the fridge. What meat I have thawed for the day. I have called this beef stew, but you could easily change out the beef for chicken or pork. In fact, you could add no meat or beef broth and use vegetable broth and still have a yummy meal. Fall is one of my favorite holidays. I love the leaves and their changing colors, the cooler weather and the holidays (Halloween and Thanksgiving..YES, I am a kid at heart). Although we eat soup all year long, we don't really eat this type of stew until the weather starts changing. This happened this week. I was told that the east coast is pretty "by the calendar" with their season's. I was impressed when spring hit with rain and warmer weather in March and here we are with September a week away and the change is in the air again. I welcome Fall/Autumn with open arms and a big hug. LOVE IT! 1 package of stew meat (a pound in a half works well). 1/2 bottle of beer (optional) I would choose a strong flavor, it adds a wonderful undertone to the stew. * NOTE: To make this Gluten Free, you must use Gluten Free Beer or omit this step. 1. In a large bowl add flour and meat. Toss until well coated. Heat oil in a large skillet and add floured meat. Brown each side. 3. 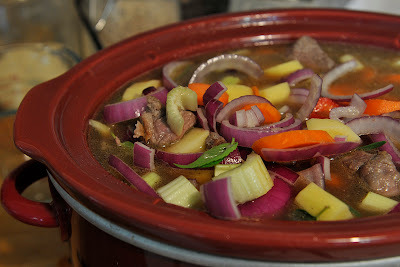 Plug your crock pot in and add all of the ingredients: meat, veggies, beer, broth, herbs and spices. 4. You can cook on high for 4 hours or on low for 8-10 hours. 5. Before you serve the stew, check the flavor and adjust the salt and pepper. You can used dried herbs too. We just love fresh and this is what I have on hand. This gives you an idea of what the stew will look like right before it starts to cook. Agree - my boy is going to kinder this week and it is hectic with all the errands and manage to drop off/pick up in two locations (my daugther in preschool)... I love this beef stew. Looks really comforting and it's great dinner!!! 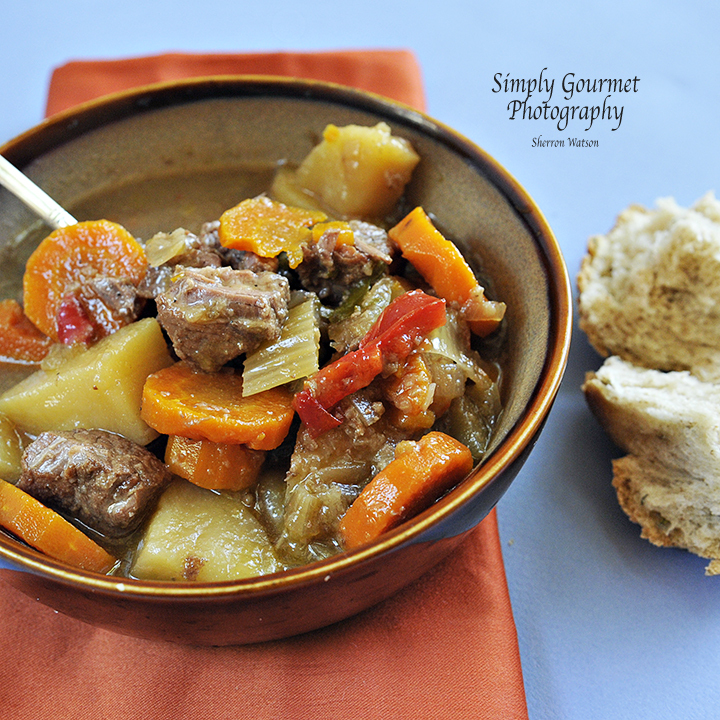 I love beef stew and I love the way you made such a simple meal look so gourmet! I've wanted to post about beef stew, but didn't think I could make it look nice. I agree, stew is the perfect one-pot meal for busy weekdays. We eat it year round. Thanks for sharing your recipe. I never made it with beer before. I'll have to try that next time. I can only assume GF is the brand name for the brown rice flour, but what does that have to do with the type of beer??? Does GF have a brand of beer? I would normally use a Stout or Amber Bock beer for cooking. I'm asking regarding your note? NOTE: To make this GF, you must use GF Beer or omit this step. Hi Lee, Sorry for the late reply ( I had a small medical situtaion that I had to take care of, I was at the ER when your question came in)…and to answer your question the GF stands for gluten free. A stout or Amber sounds like it would be wonderful and add a nice flavor to the stew. Again, I apologize for answering you so late. Have a good night! Thank you, giving it a try. Love beef stew. I believe GF is gluten free. I plan to try this in the next few days, the nights are getting much cooler. I love fall!! Thank you for answering the question, I will change the verbage in the recipe so that everyone will know. 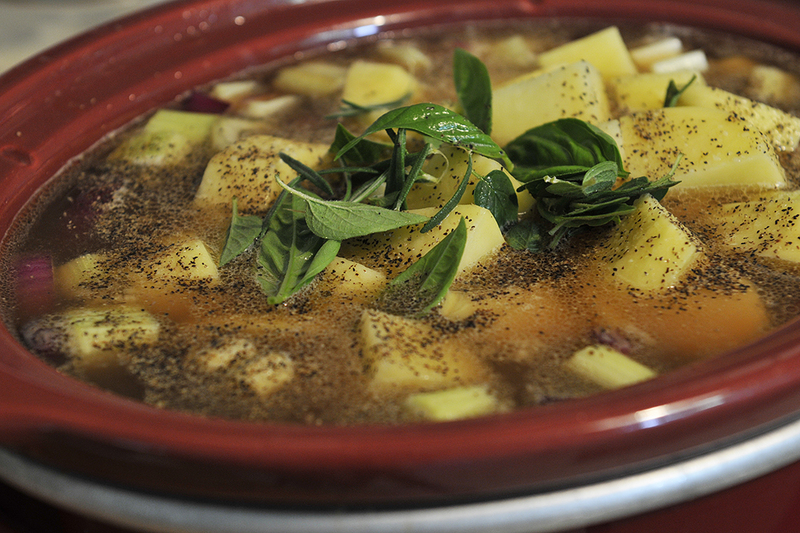 How do you think barley would work with this stew in the crock pot? Hi Judi--I think if you added barley it would be great. I don't know if I would add barley uncooked though. I am more inclined to suggest that you precook it and then add it to the stew. If you do choose to add the uncooked barely you will need to adjust the liquid in the stew. Let us know how it turns out either way you decide.